I know. It's Sunday. Don't worry, for the faithful tied to a routine, I will repost this on Tuesday! But Sarah's book is hitting stores and the internet and I had to get the news about it out before the holiday! For you last minute shoppers looking for a great book for someone, look no further. Sarah Winters and I came across each other on a Twitter chat for writers. We started following each other and have been chatting away ever since. Sarah is nice as can be. She generously retweets and directs people to my posts, and is a great writer on top of it all! Her novel, The Strongest Fire, has just hit the stores and internet. 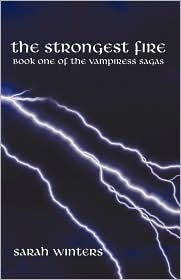 If you love vampires but are tired of all the old cliques, you're in for a treat. Sarah's book promises to be very unique. The first chapter has already sucked me in and left me hungry for more. I hope its in my stocking! Thank you so much for all the kind words. Plus, you just gave me a wonderful early Christmas gift! Thank you again. I’m all smiles and blushing.